Monitors have found all thirteen species known to occur in our region. Below is a summary of who has been found from the most common species to the least. 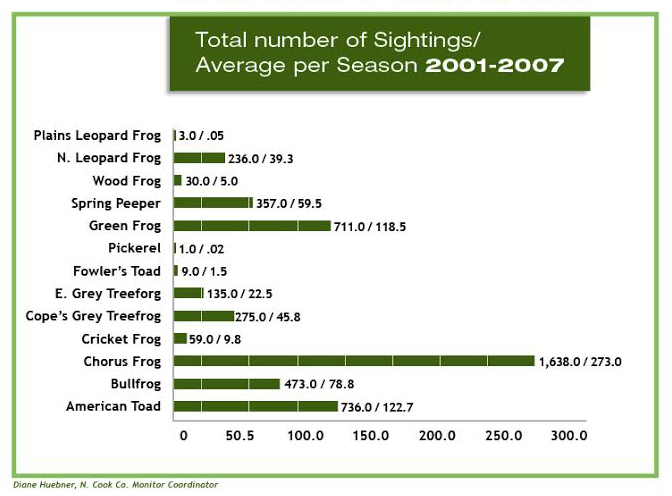 Chorus Frog, Green Frog, American Toad and Bullfrog were commonly discovered at most locations. Spring Peeper, Gray Treefrog and Northern Leopard Frog were less common but locally abundant during certain years. Eastern Gray Treefrog, Cricket Frog, Wood Frog, Fowlers Toad, Plains Leopard Frog and the Pickerel Frog were generally quite rare and local. Numbers and species of frogs/toads recorded are highly dependant on temperature, weather and terrain, so their relative abundance varied from place to place and from year to year. Chorus Frogs were the only species found in every county, most commonly in Cook, DuPage, Kane, Lake, IL, and Will Counties. The rarest by far was the elusive Pickerel Frog, only recorded from Kane County, one July evening. The spring peeper was the most commonly recorded species at all sites in Indiana. The Spring Peeper can be heard both morning and evening. As its name suggests, this is one of the first frogs to come out of hibernation, commonly heard from March to May, but occasionally in June. Thanks to Jane Dorman for contributing to this analysis.